One of the most important developments in European history took place in communication. A transition is clearly visible from illiterate societies to societies in which most members are active users of the written word. This complex process, which started in Antiquity, and is still not complete, gained momentum during the Middle Ages. The platform is intended to provide a forum for research on the history of non-verbal, oral and written communication in the Middle Ages. 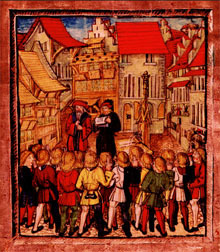 Interest in the subject has been widespread within the worldwide community of medieval studies for some time; ever more scholars are becoming convinced of the potential of studying the tensions between oral and literate modes of thought. In 1996-2000, the Utrecht project Communication in the Earlier Middle Ages (c. 400-c. 1200), under the supervision of Marco Mostert, studied the changing interaction between written, oral and non-verbal forms of communication in Latin christendom. It had been generously supported by The Netherlands Organization for Scientific Research (NWO) and the Research Institute for History and Culture (OGC) of the Faculty of Humanities of Utrecht University. Since then, research in the field continues to be carried out at Utrecht University, under the auspices of the Utrecht Centre for Medieval Studies (UCMS). The series Utrecht Studies in Medieval Literacy, published by Brepols Publishers of Turnhout, Belgium, has developed into a general forum for publications on the history of medieval communication. This website is meant to provide references to the series’ contents, to new publications, conferences and workshops, and to the most important websites of research programmes devoted to the study of medieval literacy.